Fiona Bruce and the team visit Audley End near Saffron Walden in Essex. One of the items uncovered is the sword that ended the War of Independence in America. Browse content similar to Audley End 1. Check below for episodes and series from the same categories and more! Our venue today has had a varied past. it was gradually made three times smaller. But, still, today it is magnificent. and a hotchpotch of styles on the inside. near Saffron Walden in Essex. particular rooms with particular functions were lost forever. But here at Audley End, there's a very rare survivor. quite possibly unique for a stately abode like this. and to provide heat for their hip baths and foot baths. And the coal was brought up by the bucket-load through the window. Now, that's some kind of carbon footprint. to get the fires going. They were long, hard days. The Neville family, who owned Audley End, had up to 30 staff. along with the kitchen maids, would prepare the meal. the dairy maids had the task of churning the butter. The laundry maids would clean and iron the clothes. And they would do this for hours. the bend in the river went the wrong way. this well-shaped landscape and house. where we find our specialists hard at work. When you first saw this elephant here, what did you think? I've always loved this elephant. then we were allowed to go upstairs and see the elephant. Yes. as a child, as a Christmas present full of chocolates. Ah! Well, let's have a look at him. "Goodness, how did you bring that in? He must be so heavy!" but it's, you know, it's calf suede. And you couldn't sit on him as a child. Well, I hope you didn't! No, we were never allowed to sit on him. The good news is that his tusks are not ivory... No. a hell of a lot of chocolates can go in there. It's just a small part of it. Yes. I think he's somewhere around 1890. Shall I pull it? Yes, you can pull it. That does sound like an elephant! It sounds like a sheep! and then, I agree, it sounds like an elephant. Can I do it again? Yes, you can do it again! Thank you. Oh, I see, that would've been so realistic! So exciting. Oh, I'm sure that can be rectified. cos usually they lose their voice. Yeah. I think we've got to be talking about around ?1,500 to ?2,000. Well, we'd never sell him. At least now we know he doesn't sound like a sheep! than what's known as a Fair Hebe Jug. There's so much going on, isn't there? inscribed there, "a bumper, a bumper." That's a happy toast, he's merrily getting drunk. though she seems more interested in somebody else. And there's her name, Fair Hebe. Do you know the story, or anything about the history? I don't know anything about Fair Hebe, no. that came out of the jug. Is there... Have you found a signature on it? and it's actually dated 1788. I didn't even see the date. Hard to see, but that takes it back a nice long time, doesn't it? to make models for the Wedgwood factory. and ended up sentenced to seven years in prison. And it was probably in prison when he modelled this jug! So it makes it even more interesting. We don't see Voyez's name on many of his pieces. and tried to pass them off. He was a faker, really. Really? this is an early Staffordshire pottery through and through. This was my mother's, which is why I brought it. Before that, it was my great-auntie, Sarah. Now, they were from the Midlands, does that tie in with Staffordshire? that's where this jug was made. And, so, Auntie Sarah's jug never travelled terribly far in its life. but I think we can forgive it that, don't you? Oh, yes. I forgive it everything! I had a vague idea it might be like that, yes. is stretching my expertise to the very limit. you see more and more difficult pieces. and it really makes me have to think very hard. what can you tell me about it, where did you get it from? for a very special birthday last year. It was given to me by my husband to make it less painful, basically. "Where do you want to go for your birthday?" I said I wanted to go to Leicestershire. and therefore there was no better place than the Battle of Bosworth. So, the Battle of Bosworth, 1485? that this piece was made around that time. Well, pieces like this fall into two, or possibly three categories. Right. One, that it's totally original... Yeah. ..two, that it's a fake, a made-up fake... Yeah. ..three, that it's a 19th century revered copy. "Surely this can't be a period piece?" I then had a peep earlier at the inside of the door. and if you were underneath you'd get all the sawdust on you. you've got this wonderful ogee trellis here with this carving. hand-carved by an artist who knew and loved his work. The hinges on the locks to me are all very, very good signs. ..I'm perfectly happy about it. Let's just for a minute think, do you know what it was used for? or possibly ambry, one of the questions I actually have for you. Well, it's French, and it would be a dressoir. Right. The wonderful thing about these, the original ones... Yeah. ..are made to go in the main room of a house. Yeah. And dressoir means you would dress it. to bring people into the house to show them how wealthy you were. so you'd dress your dressoir. Yeah. So that's the correct word. the same date as the Battle of Bosworth, 1485.
if it's what I think it really is. generation after generation, and possibly another 500 years. SHE LAUGHS Thank you. Thank you very much. I've had quite a few deja vu moments here at the Antiques Roadshow. because things like this, back in the 1970s, were my stock in trade. Is it something that you or your family use? It's not, I don't really know too much about it. in the late '60s and early '70s. I can only surmise that he acquired it. "Can you take this up and scrap it?" No! No! ..and I couldn't bring myself to do it. Thank God for that. Well, obviously, it's here. "Look, it's a beautiful thing, I can't do it." He obviously wanted the money, so we came to an arrangement. And how much was that? You rescued it, in other words. Yeah. Well, obviously, you know what it is, it's a Dunhill. I believe so. Nine carat gold... Yeah. ..cigarette lighter. Can I open it? Of course, yeah. ..and the powder goes there and the mirror's there. we press the side piece here and the watch shoots out. This was called a vanity compendium. I looked at the hallmark... Right. ..and this is 1933.
which you can see it is. It's so fine, it's finely reeded. and lift the flap, and pull it, and you've got a gold pencil. I mean, that is extraordinary. The downside is smoke has become less popular. and the other upside is that Dunhill is very collectable. So, they're made in Switzerland. Right. I mean, obviously the watch is a Swiss watch. But in the '70s, I used to sell one like this for about ?900. Right. But you paid 2,000, didn't you? 2,500. 2,500.
triple it, actually... Right. ..and it's between 7,500 to 10,000. It may be even as much as ?12,000 for this. So you were right to rescue it. what do you think you're going to do with it? Keep it. My father died a couple of months ago. I'd do just the same, I think. Yeah. No, I won't be selling it. "largest and best travelling exhibition ever organised." What's your connection with it? and that was the start of it. So I think we've got to remember how exciting... Oh, yes. ..that was for people in the 19th century. Yes. and she wrote about them in her diaries. Again, because it was such a fascinating thing. with lions and tigers and elephants. I mean, incredibly exotic. Mm. they took ?44 at Banbury. But all these other, Broadway, they travelled all over the countryside. Yes. And all over the world. And this is, who's this gentleman here? So, a fascinating piece of history. being excited when the circus came, or when the fair came once a year. it was even more exciting. Mm. but it's the personal connection... It's the connection. ..that's so important. Yes, it is. Hello. Hi there, what have you got in this briefcase? They are what you think they are, yes. ..toilet chain pulls? That's correct, yes. Well, I used to watch this show back in the '80s. in Brighton, and I understand it to be Royal Doulton. So how many have you got of these things? So it must mean you're FLUSH, then? a very common piece of furniture in the Victorian and Edwardian periods. it's not very special, is it? Now, the suffragette movement was very powerful in Scotland. I think the focus is always on London and the South, as usual. What did Scottish suffragettes do? normally from 1911, 1912 onwards, was important in Scotland. was the doctor that did it. Only what I read or found out about him. the four suffragettes that were there at the time. I think we have to think briefly about that. humiliating, dangerous and utterly unpleasant. and it was administered by doctors. And this was the big debate at the time. which we must not forget. This was a great fight for freedom. that you and I have until 1928. What's it worth as a cabinet? ?40 or ?50. Yeah. But that's not it. That makes it a really important piece of social history. That's what it is, the history of it, I think it's brilliant. Yes. Just to find that out about it. Well, you did very well rescuing it. Thank you very much. Thank you. Pleasure, thank you. and then the family of the fishermen come and take the fish off the boat. It's an extraordinary capture of early 19th-century life, isn't it? Absolutely. And it's by Edward William Cooke. Yes. Signed and dated 1839. Yes. And why are you interested in Cooke, if you are? although he's not a very famous painter. Well, he is in my world. that, in those days, Britain was very much king of the seas. in those days in a way that they don't now. and look at it with older eyes? and shipped it straight to Billingsgate to be sold fresh. It's a very different food chain, isn't it, looking back? Absolutely. And much more real, somehow. Yes, healthy. Mm. I rather like the boy. He's probably the skipper's son, isn't he? Cos the clothes look too big for him. then I'd be able to say exactly where it was, but I don't. I know that he liked to go to the Isle of Wight a lot... Yes. ..and it could be there. it has been quite heavily cleaned... Yes. and the sky has gone down a bit as a result. His skies are so luminous. but less so perhaps than one in very fresh condition. Mm. when this picture would've been worth about ?20,000. Yes. but I worry that we wouldn't quite get there these days. Yeah. But it's still a wonderful picture. is where do you keep such an extraordinary object? and the four lions are on the piano. I think this was designed as a table centrepiece. you'd need quite a grand dining table to accommodate such a thing. that something of this nature perhaps would have been made for. So, what do you know about where it's from or what it's made from? Well, I know it belonged to my father and his first wife. It used to be in her small sitting room, on a table in the corner. if we had visitors, to try and make it a bit more attractive. a kind of stoneware called Black Basalt. And Black Basalt is most associated with Wedgwood. ..that there's an impressed Wedgwood mark. I've never seen this. Oh, right. but apart from that, I know of no other. What is so interesting about it is the quality of the moulding. the flutes of the column have been created. who would really love this. I'm going to put a figure of ?3,000 to ?5,000 on it. set by our experts, The Enigma. brought along by our silver specialist, Alastair Dickenson. This looks fiendishly difficult, Alastair. I haven't got a clue what that is and I know you've got three options. Certainly have. So, what are they? Well, the first possibility is that this is a stone holder. Why would anyone want a stone holder? Ah, well, it's not just any stone holder. We're not talking a pebble from a beach, here? We're not. Right, OK. We're talking of something more like a gall stone. And it's called a bezoar stone holder. and it means antidote or cure. And the bezoar was meant to guard or cure poison. and they made these lovely containers to put the bezoar in. When abouts are we talking? We're talking of the late 17th century. if they went into something that size, is what occurs to me. It must have made that goat's eyes water! I have heard of bezoar, so it's not quite as preposterous as it seems. The second possibility is that this is a miniature globe holder. the normal case for a globe would be made of chagrin or leather. Of course, they all fell apart in the tropics. for these smaller, more portable globes. as gifts to visiting emissaries and dignitaries. We've had some beautiful miniature globes on the Roadshow in the past. they were usually given to foreign dignitaries. Well, that's handy, isn't it? That's why we haven't seen one! Exactly. which makes me think maybe it has the ring of truth about it. way back in the 14th century. about things that they loved talking about. ..Christmas trees have balls hanging from them. but they originate from the story sphere. I'm quite confused, I must say. What was the second one?! LAUGHING: Miniature globes. The miniature globes. Or the bauble on a Christmas tree. So, what do we think? Any ideas? Goat, has to be... Where's the globe? Where is the globe, if it's a globe case?! I think let's go for the goat, the bezoar holder. No, but that's what we're going for! Well done, that lady who told me about that! The bezoar was a massively valuable thing. a bezoar was worth ten times the value of gold. and that's why you had these wonderful cases. and telling us some preposterously tall tales about it. So, do you remember these from your childhood? No, not from when I was very young. it was sort of kept away from us. I was a bit destructive as a child. Well, you know, you and me both, really. Dean's New Magic Peep Show Picture Book. this is rather more for children. And the first two peeps of this are just fantastic. They're the wonders of the age. So, it is a pretty amazing thing, actually. Unbelievable. and this is the Thames Tunnel. and the intention was that it was going to be for wheeled transport. so it became a pedestrian tourist attraction. Right. And about two million people a year went to see it. and they were having to go to school. which is Dean's Pantomime Toy Books. and it's just so dazzling! which allowed cheap mass production in colour printing. And it's not just a little bit of text and a picture in the middle. It's got folding pages and the whole story of a Aladdin told in pictures. and I think you've got some quite valuable things here. and is worth perhaps ?200 to ?300. Blimey! I didn't think it was anything like that. I just liked them. So it is the best part of ?1,000 there. but this is a sword with a really special story. which was a very dismal result. It was. And wasn't Cornwallis's fault. they couldn't get out, there was nobody coming for them. And he had to surrender. And Cornwallis was diplomatically ill and wouldn't attend. That, I didn't know. Poor man. Oh, dear. How very sad. the end of English possession... Absolutely. Absolutely, it was the beginning of the end. And this is the actual sword? And this is the actual sword with which he had to surrender. they gave the sword back. Yes. So we've had it pretty well ever since, I think. But it's just an ordinary sword, really, isn't it? Yes, it's just a work... a workmanlike sword. Mm. Goodness me, that is amazing. It's such a fascinating thing for the American market. It is, isn't it? It represents the start of modern America. but I think we'll probably have to keep it. Splendid. I wonder if there's a secret inside. Tell me about this work box. and we think she got it about 1900s. she was always writing stories. She wanted to be a journalist, but wasn't allowed to. and other things that she wrote in this work table. Janet Gemmill. Janet Gemmill, yeah. And, so, she kept her scripts in here? and the ones that were rejected. Right. They were always in there. And why didn't she become a journalist? I mean, woman's work and all that sort of thing. Oh, gosh, yes. You know, her grandmother just didn't let her. Let's just put this back down again. "Are you sitting comfortably? Then I'll begin." LAUGHTER And here it is. "for years and years and years. "the father of their beloved Princess Coralie." but it has been read out! So that was very good. So, we're saying that she got this as an engagement present in...? Of course, it was not new then. of the walnut furniture made around the middle of the 19th century. And she obviously found this very special use for it. Mm. and it's got quite a bit of damage to it. it's probably only ?300 to ?400. the value of what's inside, to you as a family, is very much more. Very interesting people, I can see that. How did you come by all these scarves? we belonged to a choir called the London Youth Choir. And this was when? This was in the early '50s, 1950s. And our aim was really a sort of, hopefully, singing for peace. You know, world peace sort of idea. what kind of countries did you visit? We went to the East European countries quite often. So, Poland and Bucharest and Prague and so on. All the communist countries, all part of the Soviet Republic? Yes. And then where did the scarves come in? They were given to us. Most of them were made specially for each festival. How fascinating. certainly since I've been on the Roadshow. he's our specialist in scarves and he'll be thrilled to see them. and it's very unique to us. it makes us think about past generations. is that two very, very different styles are in the same family. which is these wonderful pearls. Tell me about how you got these. to whom they were given when my husband was born. So, they're an heirloom? They're an heirloom. And have you had the honour of wearing them yet? so actually quite a special piece of jewellery to all of us. They are a beautiful example of natural pearls. because they are so rare today. And I love the fact that you've got this wonderful diamond clasp. or married together with the '50s clasp. But then suddenly, we have something completely different over here. and when did you see this? which was given to me by my mother-in-law. OK, so it was from the same collection. It was from the same, yes. a jeweller no longer with us, I think. And I have no idea by whom it was made. to this style and this type of ring. Well, I absolutely love 1970s jewellery. I did then, and I still do now. and I just love the bark effect. I am so in love with this, so in love with this ring! and diamonds were just there just to highlight a design. And this stone is a tourmaline, which is a natural stone. And this would have come from Brazil. and they're highly collected now, today. The '70s period is really quite in. And the only thing is, there is no signature. and I would love to know who the craftsman is. Maybe, he might be watching. Wouldn't that be wonderful?! Wouldn't that be wonderful? Yes, it really would. It really would. We'll let you know if we hear. Thank you. We'll let you know. so you're not being left out, here. You've definitely, definitely got a wonderful heirloom. you don't find these in the oceans any more. Wow! Slightly more than you thought! Now, as for this one, do you remember how much you paid for it? That would be a really good end to the story, thank you. you brought them out, I couldn't believe my eyes! and wasn't it through going to world peace festivals? That's right, yes, it was. And when was that? and into the '60s, but mainly in the '50s. in the days when they were shut off to most people? It was the only way to get in! Well, these scarves are fabulous. and it's these up here. What does that say? "Liberte, solidarite." one of the most famous artists of the 20th century. Really? Fernand Leger. I knew the name, but I didn't know he was so famous. He was a cubist and a modernist... My goodness. ..and his work is really sought after. And this chap here, who did this one, needs no introduction at all. No. We all know who Picasso is. These are propaganda scarves to collectors. Yes. and festivals like you went to. People really love these things. from this type of collecting that I know of. Golly. And this Fernand Leger, as I said, is a huge name. Unfortunately, it's a bit smudged, but it's not too bad. Maybe this one's worth about 800 or 900 as it is. in a New York sale a few years ago. but also a box of draughts. What have you brought that in for? and I found a draughts box, which I thought contained draughts. and it rattled, so I looked in and I found the medals. that I want to talk about and that's this one here. This is the Distinguished Service Medal. at the Battle of Jutland. He was a chief petty officer stoker. and was awarded the DSM. So he was quite a brave man? Yes. in 1916, on 31st May and 1st June. it was the largest naval battle in the First World War. Many sailors were killed, many ships were sunk. and important group of medals. These medals do have a value. but you were about to give them to a charity shop, weren't you? Yes. you've got a 1914-15 Star. I never imagined it would be that amount. But they stay with the family, as far as I'm concerned. and I'm supposed to be the jewellery man. But tell me all about it. for all little pieces like this. Yes, and who took you there first, was it a friend? Yes. They call it mudlarking, don't they? Yeah. and you've found them perfectly, haven't you? And tell us why that is. Because I like that there's still teeth inside. And this is a jawbone of a sheep and we can only guess how old that is. and people hurled all kinds of trash into it, simply to get rid of it. and have you any idea why I like that one so much? Is it because it's very old? but it was made on the other side of the world. and we can only guess at the sort of people that were eating from it. and then, dang it, the servant breaks the plate. and then you come along 400 years later and find it and show it to me. Well, if that isn't magic, what is? It's wonderful! and they're enormously valuable to me. and maybe, one day, you can make a career from it. What would you like to be when you come to work? LAUGHING: Of course you would! I know! Thank you very much for bringing them. It was really good, wasn't it? Yeah. In the 1920s and 1930s, there was a lot of interest in fairies. there were fairies at the bottom of people's gardens. because you've got fairies on your sideboard from what I can see. Have you been living with these fairies for quite some time? 12 years. Yes. And before then? from about 1962 until 2004. Oh, right. Right. Do you want to go further back? If you can go further back. They were owned by a cousin of my aunt, who lived in Johannesburg. Goodness me, these are well-travelled vases! They are. ..and now they are fairies again in Saffron Walden. They are very special, because they remind me of my aunt. Ahh. That is what it's about, at the end of the day, isn't it? with the next inheritor in her arms... That's it, absolutely. is Daisy Makeig-Jones, as the designer. Yeah. and...under the banner of Wedgwood Fairyland Lustre. Oh, right. So, you've got three very nice prime pieces. is that it is very, very dependent on condition. Right, yeah. A little bit of wear. Oh, sounds good. That sounds all right. That's a good sound, that is a good sound. I can't see any boxing fairies but, anyway, that's what it's called. So, it's making the right sound. Because if it had made a bit of a snare... Yeah? ..that would have been worth...?1,000? It's worth a bit more than 1,000 now. at around the 3,000 mark. Holy smoke! Really?! Maybe a little bit more. So, leaning over, let's have a look at this one. cos you've got these columns. Yeah. Yeah, that's making a nice noise. Six?! What, for this ONE?! So... I should be sitting down! No, no, no. which could even work as an umbrella stand, couldn't it? they just dumped umbrellas in it. of what appear to be like water babies, little winged sprites. Have you noticed the sleeping dragon? Have you looked at the bottom there? Yeah. Yeah. Lovely. Did you like that? I did, yeah. Do it again! Are you sure? and I'm wondering if I can see a crack. Let's say it's one of my hairs! Do you mind if I look at it? No, that's fine. Because if it's a crack, it's ?2,000, you understand that? That's still loads more than we expected. Still loads of money. Yeah, it is. It is a crack? Hang on, let's have a look. No. CROWD GASPS LOUDLY Oh, my word! OK, that woke the baby! You are joking?! My goodness. Where money's concerned, I never joke, I never joke. but in your house, it's come good. Yes, absolutely! something to remember when it grows up. I told you, I don't need any help. And I told you, you've got it. Leopard changed its spots, has it? 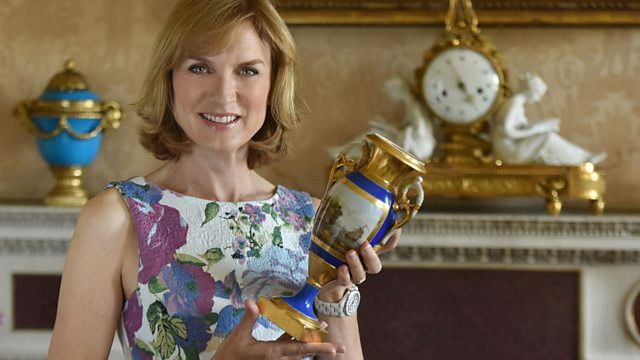 Fiona Bruce and the team visit Audley End near Saffron Walden in Essex. Scouring through the family treasures brought in by visitors, the experts discover a varied set of items. These include the sword that ended the War of Independence in America, a large collection of toilet chains, a beautiful silver container that once contained the gall stone of a goat and three vases decorated with fairies.